The restaurant stands on the south side of Utsubo Park, close to Honmachi Station, Osaka. Step through the door, and you are confronted by a natural wood counter, and luxury seasonal ingredients, such as the delights from the sea and the soil. 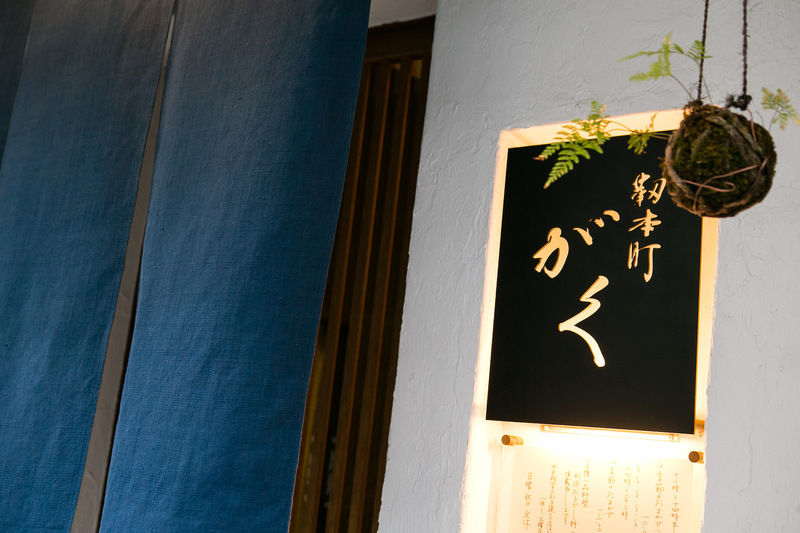 The fact that Utsubo-Honmachi GAKU gained its first Michelin star just 6 months after it opened is a testament to Chef Imagawa's ability. 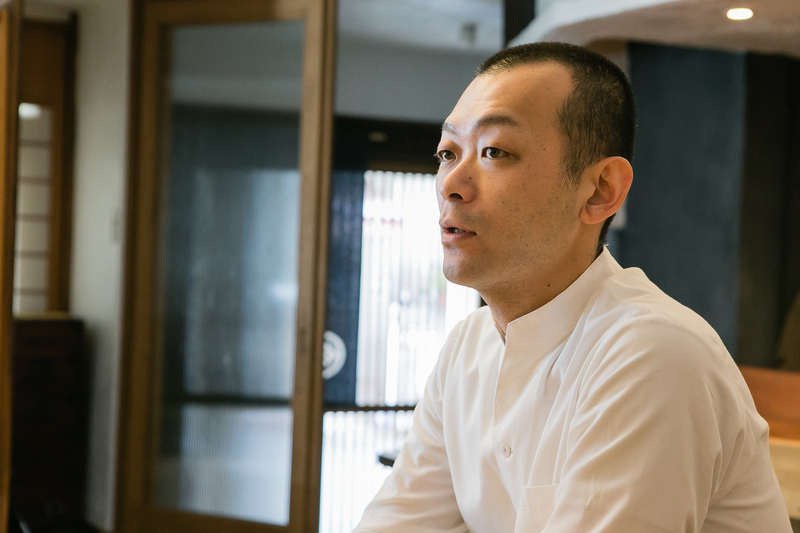 Just 10 years after he first dived into the world of cooking, Imagawa was able to open his own restaurant when he was 36 years old. 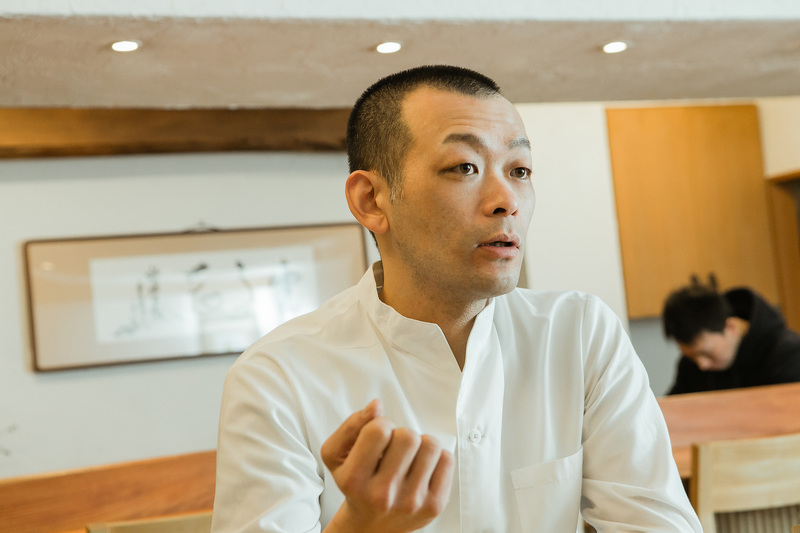 What kind of life has this prodigy of Japanese cooking led, and what are his goals? We spoke to Gaku Imagawa to find out. Point1. Imagawa turned to cooking when he was 26. The feeling that he had nowhere else to go was his motivation. Point2. He treats cooking as a pursuit of knowledge, rather than a job. The important things are one's early days, and having depth as a person. Point3. The culinary world expands anew through the efforts of young prodigies. Well, it’s not like I decided I wanted to be a chef when I was little, or anything like that. I also didn’t attend a culinary school. Originally, I was studying architecture and civil engineering at university. When I quit university partway through, I considered what I should do, but since I left without finishing, I had no education or qualifications. At that time, my mother took me for a meal at the restaurant, Tenjinzaka Ueno, and I thought that cooking seemed quite fun; that was the spark that inspired me. My mother (culinary expert Reiko Imagawa) ran a cooking school, so I have always liked cooking, and, on my parents’ advice, at 26 years old, knowing nothing of cooking or Japanese cuisine, I dove headfirst into the culinary world. Tenjinzaka Ueno didn’t have any openings available, so, on their referral, I began working at Kigawa, run by Chef Ueno’s son. Entering the world of cooking at 26 is quite rare, isn’t it? That’s right. Inevitably, I was late to start, so age-wise, I had nowhere else to go, and I thought to myself, “If I give up cooking, what have I got left? !” When I think about it now, I believe that sense of being on the edge acted as great motivation for me. 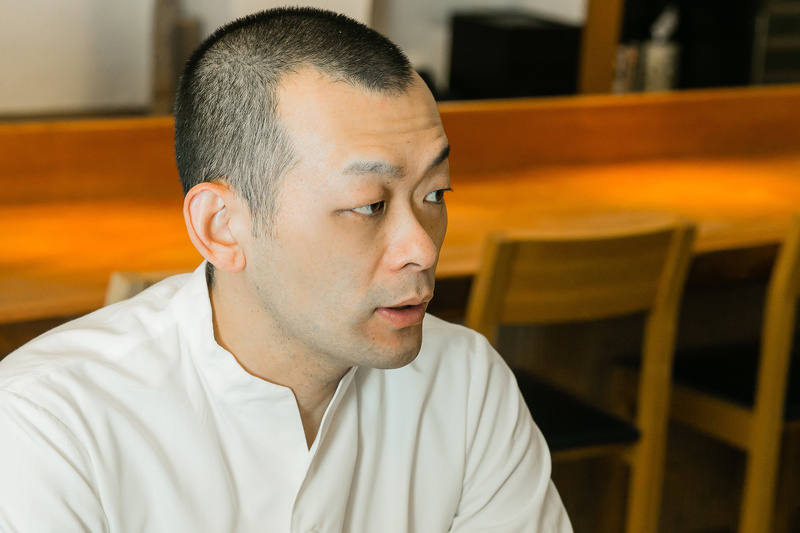 I vaguely felt like I wanted to open my own restaurant, and I thought that I should be able to achieve that after 10 years, so I settled on working at Kigawa for the next 10 years. What was it like during your period of training at the Japanese restaurant, Kigawa, and then the bistro, Le Noeud Papillon? Since I was a latecomer, at first, I was worried about everybody around me, but all the people in the higher ranks were older than me, so it was easy to get on. One chef who was old enough to be my father told me, “Be patient! Once 10 years have passed you’ll be the same as everyone who started before you!” When I think about it now, it’s exactly as he said. Kigawa was an old kind of restaurant, but it wasn’t as strict as the places you might see on TV; yet, they wouldn’t teach me much unless I actually asked. And, the way of asking as well, you couldn’t just ask, you had to try things out and study by yourself first; then, when you felt like you had failed or didn’t understand something, that was the point when you could ask someone. Otherwise, the teaching wouldn’t leave an impression. Even now, since I’ve become the one who has to consider the training of the people who work for me, I believe the question of just how much to tell them is a difficult one. Having achieved the feat of opening your own restaurant after just 10 years, I guess you could say that you had innate sensitivity but do you think that chefs require good sensitivity? What I’ve seen from observing many different people is that everybody has things that they’re suited for, and things that they’re not suited for. And, obviously the question of whether or not they have taste comes into it, but I think if you label that with the word “taste”, then the number of people who are actually able to do something becomes severely limited. I believe that good taste is born from various experiences. I think that cultivating good taste is connected not only to things related to cooking, but also to displaying interest in various things, gaining knowledge and gaining experience. Obviously, some things are innate, but I think the things we acquire make up the majority of it. Even the kind of cool chefs you see on TV must have got where they are because they accumulated so much experience during their early days, and to “work one’s way up from humble beginnings” might be a bit of an outdated idea nowadays, but at the very least, I think that inheriting traditional ideas during that period is a boon. If you think that training in a lowly position is unreasonable, you won’t be able to succeed no matter what you try. Young people nowadays are much more concerned with the idea of “jobs” rather than training, and tend to put more importance on working conditions, but I would like more young people to value training and study well without neglecting this early period.